Played out this just recently at the club in Goulburn, with the help of a few others. Stayed over night again as usual and enjoyed some local Thai cuisine on the Saturday night with a few of the guys..... a good bit of nosh the night before battle is a must. “Finally Pyrrhus, unable to make headway, brought to the front his elephants, until now held in reserve. The Roman horse was at this time, seriously, and as Laevinus imagined successfully, threatening Pyrrhus’ flank. Appalled by the aspect of these huge creatures, which none had yet beheld, and which now suddenly appeared behind a roll of ground…the horse fell back in confusion and broke through the line of the legion in its panic. Pyrrhus launched his Thessalian cavalry upon the cohorts, which completed the defeat. The Roman forces fled across the river, but managed to hold the fords against the king’s pursuit, According to Dionysius fifteen thousand Roman legionaries lay dead or wounded upon the field; Hieronymus says seven thousand; two thousand were captured. Cavalry Engagement on the Roman left is finely won by them, after first blood going to Pyrrhus. 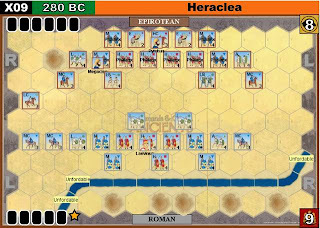 Some of the elephants manage to get in.......but Pyrrhus and his centre looses momentum falling back and giving way. Pyrrhic centre collapses and it's all over. This is the map we used for the set up and deployment, once more courtesy of Command and Colours Ancients. Very nice ideea to use the C&C scenarios. Yes the C&C scenarios seem to work well, we've done quiet a few historical fights now using the same method. A little bit of twigging here and there at times, but they certainly make the job very easy to transfer onto the table. Now that just looks awesome! Great battle report. Those are some fantastic looking figures (I love those elephants!). Fantastic looking game, great pictures and minis...a very nice map too! Thanks all, really enjoying these C&C inspired matches.